An attractive litter container in a choice of colours. 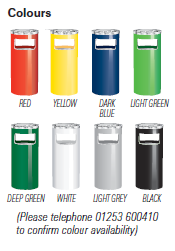 Bin: Black, Red, Yellow, Dark Blue, Deep Green, Light Green, Light Grey, White. Capacity: 21 litres (without liner), 16 litres (with metal liner). Weight: 1.7kg (without liner), 3.5kg (with metal liner).